The Judiciary is tasked with handling some administrative responsibilities for the Palau Bar Association, including administering the Palau Bar Exam, collecting fees from Bar members, and issuing Bar cards. 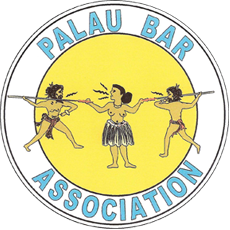 The Palau Bar Association ("PBA") is an organization of attorneys, most of whom practice or have practiced law in Palau. The PBA has been in existence for over twenty years. It serves as a proactive voice to represent the views, interests, and concerns of the legal community on all issues affecting the practice of law and administration of justice. The PBA serves as a place where legal professionals promote members' professional growth, improve the quality of the legal profession and work toward meaningful access to justice for all persons. A fundamental precept of the PBA is to encourage and provide opportunities for legal professionals to use their knowledge, skills and resources to promote democratic rule of law, individual rights, civic development and education on law and the legal system.